Easy Banana Cake with Nutella Frosting made in just 20 minutes. 13 ingredients, intense banana flavor, soft and moist, super creamy best ever Nutella Frosting. How was your Halloween night? Did you celebrate with tons of candy and popcorn and a spooky Jack as the only light source in your house? After Halloween, we head towards the upcoming holidays. Holiday baking is always pure joy. Expect to see lots of pie and cookies in the upcoming weeks. But not so fast, let’s talk about this super easy Banana Cake with Nutella Frosting first. It’s unbelievably delicious. Like out of this world. My dear Mario is a totally PB freak, but with the first bite of this banana cake, he said: “Make me that for my next birthday, please.” But I can understand this to 1000%. I love every single recipe on my blog, but this recipe is entering the next level of deliciousness. I added 15 oz of mashed bananas to the cake. The banana flavor is super intense because of the high amount of bananas. It’s like you eat fresh bananas. The brown sugar and the oil keep the cake super soft. The next advance is that it’s super easy to make. You just need one bowl and mix everything according to the recipe below. The cake itself is so delicious that you can eat it without frosting too. Maybe you add some chopped nuts or chocolate chips? Great! The frosting is uuuuuultra creamy. Best ever Nutella Frosting. It’s like Nutella but just much more creamy. You know how Nutella is eaten the most? Correct! With nothing than a spoon. You could do the same with this frosting. I’m serious. As I made and tried it, I had difficulty to stop eating it. If you are a Nutella addict as I am, you could make 1.5 times the amount of frosting. Just in case. Just for quality control, you know? It’s ok; I’m on the same team. I topped mine with whipped cream and chopped hazelnuts. But this is totally optional. If you make this Banana Cake with Nutella Frosting recipe leave a comment, rate it and tag a photo #alsothecrumbsplease on Instagram! Would love to see your snap! 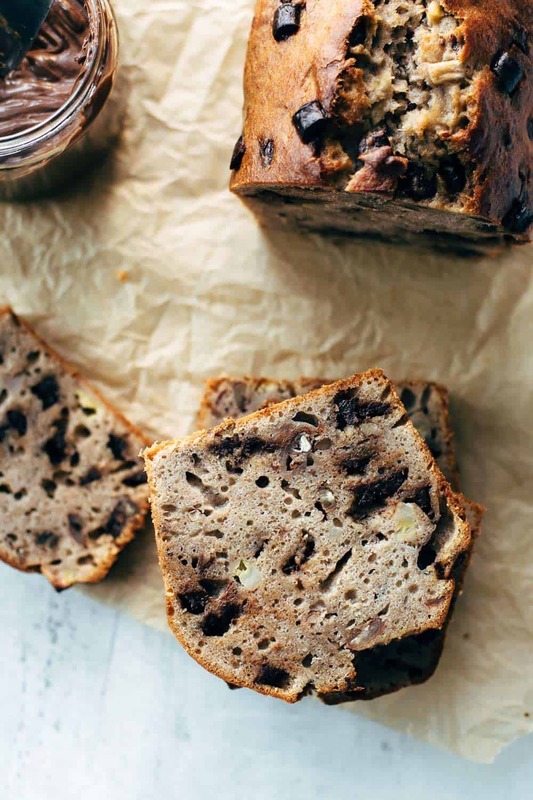 You may also like Chocolate Banana Nut Bread, Banana Bundt Cake with Chocolate Chips, Banana Cream Pie, Super Moist Banana Bread, or click here to see all things sweet. Preheat oven to 350°F (175°C). Line the bottom of two 9" (23cm) spring pans with parchment paper. Set aside. Make the cake: In a large mixing bowl, using a handheld or stand mixer fitted with a paddle attachment, stir eggs, brown sugar, oil, and mashed bananas on medium speed until smooth and well combined for about 2 minutes. Stir in flour, baking powder, salt, and vanilla* just to combine. Pour the batter into the two prepared spring pans equally. Bake for about 25-30 minutes or until a toothpick centered in the middle comes out clean. Let cool to room temperature. Meanwhile, make the frosting: Whisk butter in a large mixing bowl on medium speed until creamy. Add Nutella and stir until smooth and combined. Mix in sifted powdered sugar and salt to combine. Add heavy whipping cream and stir until creamy and smooth. Spread about 1/2 of the frosting all over the bottom layer, place top layer on top, and spread the remaining frosting on top and around the edges. Top with whipped cream and chopped hazelnuts if desired (highly recommended). Let chill in the fridge until frosting is firm for about 1-2 hours. Store leftovers in an airtight container in the fridge up to 2 days. Awww you are so sweet, Doris! Thank you so much!